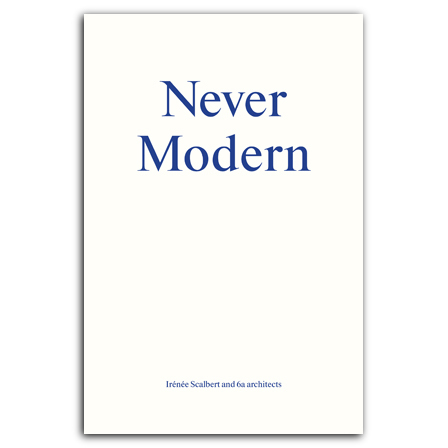 Never Modern explores the role of narrative, history, and appropriation in the works of the London-based firm 6a Architects, whose recent projects include the South London Gallery, Raven Row, and the new fashion galleries at the Victoria and Albert Museum. It examines the unique approach of the members of 6a, wherein they avoid style and signature in favor of a pre-modern sense of metis, or “flair, wisdom, forethought, subtlety of mind, deception, resourcefulness, vigilance, opportunism, varied skills, and experience.” This analysis is accompanied by a striking visual essay of archival photographs, artworks, film stills, and recent projects by the firm. In the end, the book reveals that like contemporary society in general, the architecture of 6a Architects is fundamentally a work of bricolage, creating art composed of various objects on hand and drawing from history and the everyday to create something new and vital. Short-listed for the CICA Bruno Zevi Book Award 2014. Designed by John Morgan Studio, London. was founded in London in 2001 by Tom Emerson and Stephanie Macdonald. is an architecture critic and historian based in London. He has taught at the AA School in London, as a Visiting Professor at the Harvard Garduate School of Design, the Politecnico de Milan, the Ecole National Supérieure Paris Malaquais and the Tokyo University of Fine Arts. He currently teaches at the University of Limerick in Ireland. He is the author of Never Modern (Park Books, 2013) and other essays.